After Laurie's post on C.J. Brightley's The Lord of Dreams, I made haste to buy and read the ebook. (I thoroughly enjoyed the book and recommend it, by the way.) 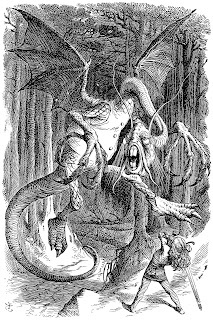 In it, the mad fey king quotes from Lewis Carroll's famous nonsense poem "Jabberwocky," which gave us such words as galumphing and chortle. It made me want to read the poem again and to look a little deeper into nonsense poetry. Whimsy, nonsense words, contradictions--they're all part of what makes nonsense poems fun. They're a great reminder you don't always have to understand something to enjoy it. So I thought I'd share a few entertaining bits of nonsense poetry here. that it had devoured – the song of a man. the least bit wiser – for the words in his mouth. The cat and the fiddle. Many nursery rhymes are nonsense. Of course, if you're a fan of Anne Elisabeth Stengl's Tales of Goldstone Wood, you'll know that they really aren't nonsense at all, but prophecy and history and marvelous tales. Do you have a favorite nonsense poem or word? My grandfather used to greet us with "Good gracious sakes a jiminy!" It always felt like a delightful bit of nonsense and was my favorite greeting; it's much more fun than a simple hello.